On this post, we’re going to review the Urgent Fungus Destroyer by PhytAge Laboratories. 1. A quick section with some basic details about the Urgent Fungus Destroyer. Designed by James Larson, a medical researcher, and manufactured by PhytAge Laboratories, “Urgent Fungus Destroyer” (also known as the Urgent Fungus Remover) is a natural supplement that’s taken twice a day to get rid of any fungal infection in as fast as 30 days. James says he started researching for an alternative treatment for fungal infection because of his brother, who was suffering from systemic fungal infection. Conventional treatments weren’t working. Worse, they have serious negative effects. People generally take 9,000,000 breaths each year. Unfortunately, the root cause of most fungal infections is the air we inhale, according to James. The disease-causing fungi we breathe in come from everywhere—air conditioning units, animals, birds, and so on. Armed with this information, he reached out to a trusted advisor in the medical community, who turned out to be educating his patients for years about the dangers and scams of big pharmaceutical companies. He didn’t give the name of this person, though. James found out from this person that he can find the ultimate natural cure from Vietnamese rice farmers, who didn’t get fungal infections despite their working conditions and inability to access mainstream treatment. So, he went on a 3-year journey to Vietnam and the deep forests of Oregon to discover how people fight fungal infections without medical treatments. What he discovered are 20 of the best natural ingredients, which he and his team studied and tested to create the Urgent Fungus Destroyer supplement. 1st step: Once its active compounds enter your bloodstream, they locate the fungus that’s causing the infection. 2nd step: They attach to the largest colony of fungus in your body. 3rd step: Your blood is purified and oxygenated with the help of a special combination of Cat’s Claw, curcumin, and garlic. 4th step: Lycopene and quercetin repair damaged cells to improve the appearance and health of the outer and inner layers of your skin. 5th step: The active compounds will get rid of your yellowish, chapped, and thick nails and skin. 6th step: Selenium, pine bark, and Graviola (soursop) are combined to get rid of the remaining fungus spores or toxins in your body. 7th step: The combination of certain vitamins and natural ingredients help filter the air you inhale to ensure you’re protected from future outbreaks. This guide contains little-known remedies that can help you manage different illnesses, such as diabetes and hearing problems, without draining your bank account or experiencing severe side effects. This natural detox program uses a two-phase activation system to get rid of toxins, such as air-borne particles and heavy metals, from your body. It also provides your eyes, hair, skin, and other body organs with essential nutrients. This detox program is done once every month, in one hour or less. This is just a quick overview of the Urgent Fungus Destroyer. Check this page on their official website if you are looking for more details about the main ingredients of this supplement. Now, let’s go through the different pros and cons of the Urgent Fungus Destroyer. The Urgent Fungus Remover is manufactured by PhytAge Laboratories, which is based in Centennial, Colorado. They already have manufactured many natural nutritional supplements that can help improve your appearance and address a variety of internal health issues. Medical treatments can be effective for many people who suffer from fungal infection. However, if they don’t help treat your condition, or if you simply prefer a natural solution, this might be a good alternative. Normally, businesses would charge extra for the shipping and handling fee. Fortunately, if you try the Urgent Fungus Destroyer, you don’t need to pay for this, regardless if you buy only one bottle or more. You can try the Urgent Fungus Destroyer for 30 to 90 days, and if it doesn’t meet your expectations, to send back your bottle(s) and get a full refund. If you have questions or issues with their product, you can also call them at 1-800-822-5753 or send them an email. Just because these ingredients are “natural” doesn’t mean they’re free from negative effects. That’s why it’s important to consult your doctor before taking any dietary supplement or herbal medicine to make sure it’s safe for you. So far, however, this anti-fungal supplement hasn’t been associated with severe side effects. The recommended dose of Urgent Fungus Destroyer is one capsule two times a day. On the website, it says you need to take this supplement every day for a minimum of 60-90 days to feel its full effects. You can only buy the Urgent Fungus Destroyer on the internet. At the moment, this supplement is not available for purchase in stores. The Urgent Fungus Destroyer could be a great option for preventing or treating a fungal infection. It helps boost your immune system, so your body is stronger and more capable to fight all types of fungal diseases. With that said, we will still recommend asking your doctor if it won’t negatively interact with the medicines you’re currently taking (if any) or aggravate your condition. In general, if you expect a 100% success rate, if you have a life-threatening case of fungal infection, or if you’re taking other medications or have another serious medical condition, the Urgent Fungus Remover might not be for you. On the other hand, if conventional treatments don’t work, if you experience severe side effects due to the medicines you’re taking, if you prefer a natural way to treat a fungal infection, then the Urgent Fungus Destroyer is a great option to consider. 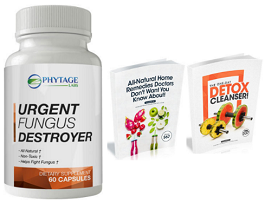 Click Here to Check the Special Discounted Packages That Are Currently Available for the Urgent Fungus Destroyer!